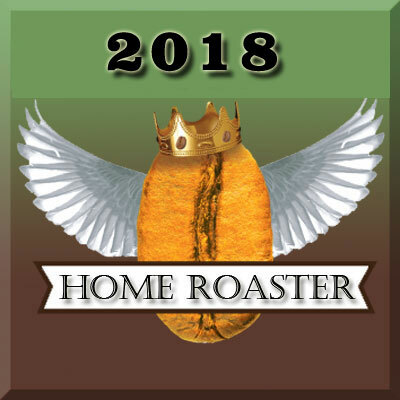 The Home Roaster Roasting Championship is back for 2018! Purchase the above as an entry into the 2018 Home Roaster Competition. After the huge success the last couple of years, the Home Roaster category will again use a "control bean". All entries will receive the same secret green bean, coffee bags and all postage paid for entry into 3 categories (Espresso, Latte, Filter). 5: Freight to the Port Mac. competition. The 2.5kg of green beans will produce about 2kg of roasted coffee so you are sending in less than half as your entry leaving you some to drink and experiment with. 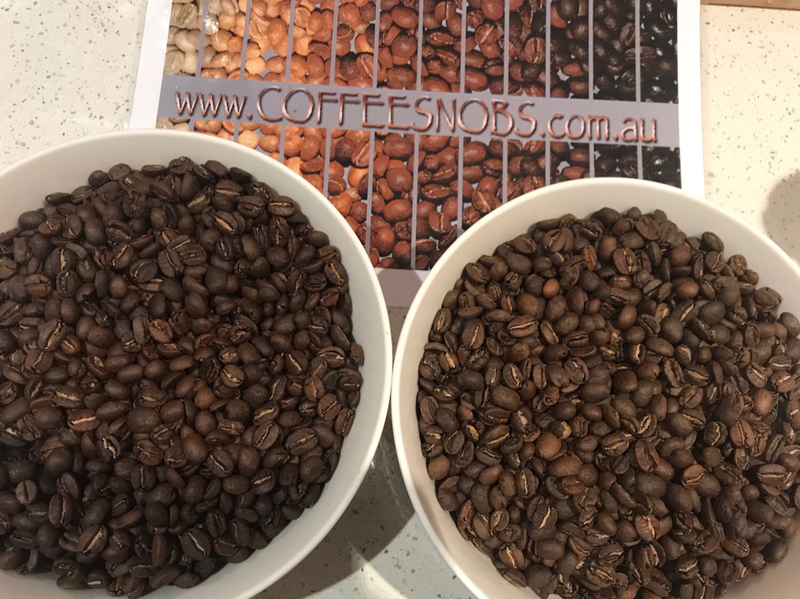 The beans will be judged anonymously by coffee industry professionals at the Golden Bean Roasting competition in Port Macquarie from the 21st to the 24th of November 2018 and the winners of each category will be announced on the night of the 24th. Entries need to be posted back on the 8th or 9th of November so they arrive here on the 12th and 13th to ensure they make it into the judging. You can enter more than once if you want. Any substitution beans will void all your entries. Late returns will not be judged. Zipper bags should be sticky-taped at the top if you can't heat seal the edge with an iron (use brown paper between the 100 degree iron and the bag). We will announce the secret beans on the 13th when entries are closed. As a Home Coffee Roaster competition, these must be roasted on a ready made roaster or home made contraption worth less than $2000. If you are roasting on something grander, please enter the commercial roasting competition at Golden Bean Australia / New Zealand or you can let us know prior and your results will be excluded from the overall homeroaster results but your coffee will still be blind judged. 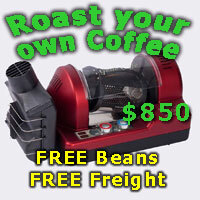 By entering you agree to sell your roaster to a fellow Coffee Snob for $2000 or less. See below posts in this thread for rule updates, information and answers to questions. Dimal, Javaphile, matth3wh and 7 others like this. Maybe a high grown washed Costa? Thanks Andy for organising again. Andy and Javaphile like this. Great to see a few people jumping on this already, because of the short time frame we'll express post everything out to make sure that there is minimal freight lag. Remember, you'll need to roast and return the 3 x 300g in the included satchel on the 8th November else they are likely to miss the freight to the competition. The 2 weeks rest should make sure these are all peaking when judged too. justacuppa and matth3wh like this. Very new to the roasting scene. I know this is probably a dense question, but taking from this will there only be one type of bean to roast? Ie will it be a single origin competition? It is a single origin, secret bean. Just received mine - fresh off the boat again this year, very pungent smell, stinking out the office at present !!!!! In a nice, grassy, hay, sort of way. Can't tell what it is just yet, will have to compare to my green beans at home. Definitely not a sundried ethiopian. Purchased the entry pack yesterday around 4pm and it turned up here in Brisbane this morning! Outstanding service again Andy! I am fairly "green" to the roasting scene but keen to give it a go, looking forward to getting some feedback from the judges. Thanks for organising a great event. Yes Tim, it's a single origin bean. Don't get hung-up on it's origin, you'll find that out after the competition closes. Near all Arabica beans are grown in a narrow altitude band and are a very similar density so it's pretty easy to use your "base" roasting method to get a good starting point. The obvious idea behind the secret bean is a level playing field, it's challenge to roast a small sample a couple of different ways then decide how to best use this bean before roasting for the actual entry. It pushes your senses and you are far more critical of your own roast and the flavours it produces (good or bad). Even just trying the same coffee in 3 different brew methods is an eye-opener for most people, especially if you tend to always drink the same drink. If you don't have a Brazen brewer don't fret, you can get a pretty good result in a plunger using water off the boil (92C), 60g/litre (ie: 20g in a 250ml plunger) and a minute steep time. It won't have the same body or depth as a Brazen but will give you a good idea of the flavours extracted without the forced pressure of an espresso machine. "By entering you agree to sell your roaster to a fellow Coffee Snob for $2000 or less." Could you please expand on what this actually entails? I'm not quite sure how to read it? It means that if you enter as a home roaster and are then found out to be using a $10,000 roaster you agree to sell it for $2,000 or less on here. Andy, Dimal, matth3wh and 1 others like this. My early money is on a central american bean. Very similar to a bunch of beans including brazil/panama/nicaragua. Also look a lot like the China Dai Muang Lem currently in beanbay. so my pick - Brazil. First test roast this morning- pretty chaffy! Looking forward to it. My beans are sitting on my work desk HQ while I’m away on a trip “down south”. Pesky work getting in the way of fun again. 藍 Next weekend will have to get started. Just roasted and cupped 25g. Oh my... What a lovely coffee! Andy and nickR like this. Anyone contemplating ordering a bag for entry, I recommend having a go! From my test batch 400g, roasts quite easy / very steady / roasts very evenly. Very few defects I only needed to pick out 5 or 6 beans. I will wait a few days before brewing V60 and pulling a few shots. Not really sure of origin yet, is it another one of the special Ugandan coffees just landed? I was thinking some kind of washed African before roasting ? I am using a Hottop roaster, with recommended roast weight of 250g greens, looks I need to do two roasts to get a 300g submission. Anyone else have this problem? I see blessing in disguse. 10 x 250g roasts, 3 test roasts 1 of each category. 6 roasts for final entries 1 backup incase a roast goes bad. You will have left overs to taste around the same days of judging. Andy, Dimal and topshot like this. ...looks I need to do two roasts to get a 300g submission. Anyone else have this problem? Someone roasting 80-100g in a popper will have to do 4 roasts per category, that's just the way it is. The first couple of years the home roasting comp was 500g (same as the commercial). The 300g is about as small as we can go and still allow the barista team a chance to dial in the grinder to suit your roast and then pull a couple of shots to deliver the best possible to the judges. Too small an amount per entry and there is a risk that a bad pour would have to be served and no-one wants that! justacuppa and Janus like this. Yap totally understand 300g is probably a small batch for sampling. I just hope I can get 2 consistent roasts in a row or I will have to call it a “blend". I'm actually planning a blend for at least one of the entries. Not just going to throw something else in there. Andy, justacuppa and nickR like this. Collected my entry beans from the post office yesterday, first look i thought they were similar in appearance to the last batch of Indo Aceh from Beanbay, however they're not as darkly coloured. Will roast a trial batch this weekend. Same origin blend of different roasts can produce great results, roasting a few different profiles then blending between them can really open-up your options. First try of attempt 1 this morning. I'd like to say it was awesome and competition winning..... but I won't. It reminds me of a roast that I tried once when I was buying roasted coffee years ago now, which I think was a Hartman Estate Black Winey. Really full on, and in a milk-based coffee - not pleasant at all. As a latte drinker, I'm struggling with this competition bean so far, I think my (now two ) roasts are in between - either have to nail a much better darker roast for the latte category, or a much better light roast for the others. mocha going on with a little fruit. Be interesting to see where this goes when I cup some later - definitely thinking a Uganda??? Think I know what the mystery coffee might be. Not my original guess... Before tasting I thought it might have been the very nice Costa Rica 'Vara Blanca' from earlier this year, but no. The mystery bean is less acidic and fleshier. I get pineapple and cherry cola flavours. It reminds me of a BeanBay coffee I had a long while ago... Similar flavour profile and the same sort of overall appearance and visual defects in the green beans. I think it might be a new crop of a certain 'island coffee', but heck it could be a lot of things! ...E.g. I've tasted Colombian similar to this in the past. Whatever, it's a good one! Andy and solace like this. Well, I have no idea. Looks like a central american, roasts like an ethiopian. A bit more of a rest and it works much better in milk. Still haven’t had a chance to roast these yet, mucking around trying to get my ROK grinder back in working order. I’m pretty close though, close enough to brew a semblance of espresso anyway.. I will roast 6 x 180g (green) batches to get me the 3 x 300g bags. That leaves me with about 7 practice roasts, I’ll keep 3 of those for backup in case I stuff up any for the competition, so I have 4 batches to practice with. Planning to push the filter roast, last year feedback was “grassy” I think which I take as underdeveloped, so I’ll definitely let them go a bit longer past FC. Latte roast and espresso roast I’m not sure how much they need to differ, I don’t drink espresso straight. Plan to take the latte roast to a “sweet spot” cooling temp I find works well at home, and will take the espresso roast a bit darker closer to second crack so it’s hopefully smoother. Might do some cheeky blending between the two as suggested by others. Andy, nickR, DaveD and 1 others like this. Just roasted the first lot. I’m without a machine as my new one arrives Tuesday/Wednesday next week. Only started roasting around 3-4 months ago and have really just tried a few beans and found something my house likes. Must admit as a rookie I struggled to picture how to roast to the styles. I understand the outcomes I’m looking for but not sure how to get the end result as a difference between filter and espresso for example. First two are done now. 3 for the comp and one left as safety net. The three for the Comp should allow me to try at least one drink from the comp beans. First two roasts went one darker than normal and the other around normal. Not came out darker than I’m use to. Andy, Dimal, justacuppa and 4 others like this. That is a very nice bean indeed. Toffee was the flavour I was trying to name earlier. It’s not too bold, not too fruity, a good all-rounder. I'm waiting to try my test roast to see what the flavours are like relative to the roast depth. The green beans smelled quite fruity and seemed to need quite a bit of heat to get them into first crack. It made me wonder if they were Costa Ricans from the Tarrazu region like some if the offerings we've had in Beanbay before. Or it could be the Uganda Mannya that Andy has in the roasted coffee section in Beanbay..............? I didn’t think of the Tarrazu initially but now it has been mentioned I do see the relation, very similar size and density - will have to look at some of my profiles for the Tarrazu and compare with the test run for this comp bean. Definitely needed a good amount of heat after drying phase, almost stalled the roast with my test run but at least have a good idea on how to extend maillard when I roast for the submissions. The test toast turned out reasonable for latte but rather unpleasant as espresso! I went for a vastly different profile last weekend which, on a taste test last night, has turned out to be a wonderful espresso! Filter, with this bean, is now my biggest challenge and certainly has me thinking outside of the box. I was circumspect with my guess of the origin of this bean earlier in the thread. I think I'll just blurt it out now... I think it's new season PNG Wahgi! I'd put money on it. Especially if it was somebody else's! After trying my samples from across the various brew methods I am now more confused than ever when it comes to this beans origin! Roasts like an East African, tastes like an Indo with some hints of a Central. This has been a very challenging yet eye opening exercise which has really made me think about how hung up I can get when roasting for a particular origin, effectively basing my roast purely on the preconception of the origin. I’m all done with my final entry roasts and look forward to getting some feedback. Good luck to all the other home roasters! Andy, matth3wh, simonsk8r and 3 others like this. Not getting the Indo thing though, an origin I normally associate with woody and black tea flavours in a filter roast. There is a bit of brown sugar and spice in there however. I can also see why the east Africa meets Central vibe and could very well be new PNG, they can have some interesting fruity characteristic like African coffee with the crisp acids of a Central. Agree it definitely is at it best at lower drinking temps, I found 50 down to 45°C most interesting for filter / V60. I am going to say Burundi. gunda, Janus and solace like this. Posted off today. Away for the latter of this week. I struggled with the first two batches. So will be interesting to see. Roasted last night, will post tomorrow. 9 batches, 3 for each profile. (1am finish, feeling it!). I have about 80-90g left of each to try over the coming weeks. Roasted the latte beans first as i figured a milk drink would hide more in my roasting as i was figuring out how to manage the roast, the first few i had some pretty big temperature fluctuations from FC which took a few roasts to get control of. I think I managed to tame the beans for the filter and espresso roasts however i haven't tried them so will wait for feedback from the judges to see how it went. The trial roasts last week for filter were horrible, i've changed the parameters significantly following some learning on Sunday so hopefully the result in the cup is ok.
Good fun, and good luck to all. Janus and solace like this. Ah cr@p! Completely forgot to do this, even had the bags in plain view of my packing area! Guess I will just have to drop them off to Andy when I am through that way in a few months. It's been great reading your approaches and roasting for the comp. I know last year I said I'd give the next one a go maybe, timing was just not the best unfortunately... aiming for next one. Dude, you should drive over and pick up an entry, not too late to roast tonight and send in tomorrow.. It was fun watching the guesses. Steve used logic and information from BeanBay to guess Ugandan and solace picked it early but the guesses of Central American were pretty spot-on. These are really unusual Ugandan / African coffees as the high sugar content makes them darken quicker than expected and the brightness in the lighter roasts is very Central style. It's also hand sorted far better than most Ugandan coffee so there were no real clues there either. It's a beautiful coffee and judging my the smells coming from the satchels delivered today, many of you managed a great roast too. Most of the entries are back, there are a couple missing but will probably appear in tomorrow's post delivery and then we can ship the lot to Port Macquarie for the judging. Hope everyone had fun doing the blind roasts, it's a great opportunity to really tune your process to produce different results. Dimal, greenman, matth3wh and 8 others like this. Thanks again Andy for making this possible. That is one awesome lot, going to have to stock up on this one as it has become one of my favourite espressos at the moment! Andy, matth3wh and Steve82 like this.